Love this addon. Is the twitter account @EclipseOnETips still active/being monitored btw? I have tried to create my own template, but it does not work. I am looking to build a template to copy content and URL at the same time. Does any one knows if the plugin offers such a possibility and if yes what are the arguments to parse in the template ? There seems to be a bug with "Remove unnecessary text"
Thank you for this superb add-on. I wish I had discovered it much sooner, because I utilize it daily to a great extent. 1. Until very recently, I was able to copy the URI's of selected links > HTML-link to paste into Outlook messages. 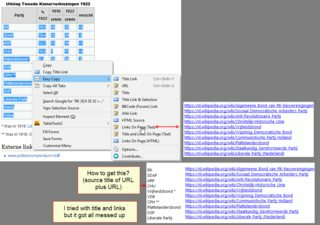 I am not sure what brought this on, but while it seems that I can still copy the URI's of the selected links, these will (apparently) paste into the message body of Outlook, but will not display the HTML-link (TITEL-link?). In fact, not one of the three Tab>Context Menu>Copy URIs of Selected Tabs will be pasted. However, any of the Easy Copy/Copy All Tabs options selected from the Page Context Menu an pasted into the message body of Outlook will function 100%. My apologies if all of the foregoing sounds awry, but it is quite difficult to explain this. I can really only say the tabs context menu is broken for me. 2. I have tried to add add an action to Easy Copy/Copy All Tabs, which will allow me to copy the TITLE-link of SELECTED TABS from the Page Context Menu. I failed in this, and I do hope you can help me achieve this by providing an example of the action for me to follow. Just wondering if there is going to be any updates to Easy Copy that may include new features? Will there be a WebExtension version of this add-on for Firefox 57? Will Easy Copy support Firefox Quantum/WebExtensions? Mozilla, rightly, introduced a very different model for Firefox extensions, one which I think and hope has made Firefox better and leaner. But it also means that Easy Copy will probably need a rewrite or, at best, a time-sapping port. I appreciate everyone's awesome feedback and I'm glad I could make the Internet a bit easier to copy! Thanks. I just stumbled across this post today. Are you (lordbii) the same person as oombii, who started this? I use MakeLink, and it sounds similar to this extension. Neither works with version 57. Waiting. The dev of Text MultiCopy addon - https://addons.mozilla.org/en-US/firefox/addon/text-multicopy/ - said (in a a reply to a request by one of the reviewers) he's considering adding this functionality in his next update. BTW - I installed his extension. It is very useful. Will there be a webextensions version of EasyCopy? As of Firefox ESR 52.9.0 (32-bit) Easy Copy has stopped working for me. No errors. It just does not copy anything to the clipboard. Jost0123 wrote: As of Firefox ESR 52.9.0 (32-bit) Easy Copy has stopped working for me. No errors. It just does not copy anything to the clipboard.